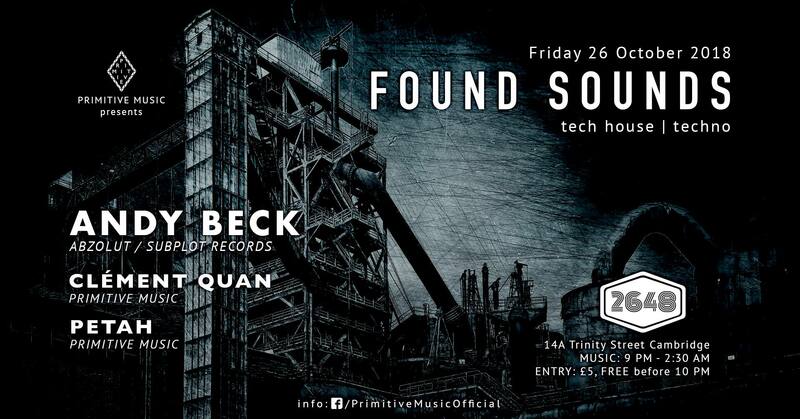 We are proud to present the sixth Found Sounds, returning to 2648 Cambridge with two of our residents, Petah and Clément Quan presenting techno heavy hitter, Andy Beck. Rising from the ashes of A:B:S comes Andy Beck. With over 10 years experience of playing and producing breaks & tech-funk in his previous guise, the new identity hails in a more purely techno focused sound and a renewed enthusiasm for the music he plays. Over the years Andy has played all over the UK at bars, clubs & festivals as well as holding a number of residencies in the East of England and running his own successful Mind-Funk events. A versatile performer he’s played alongside the likes of Riva Starr, Nick Sentience, D.A.V.E The Drummer, Chris Liberator, Basement Jaxx, Ellis Dee, Hybrid, Plump DJs, Elite Force, Meat Katie, EZ Rollers & DJ Cheeba. After a short break from releasing music, his ‘Nu Life’ track got picked up by BBC Introducing. He then put out his first techno track ‘Blister’ on Koen Groeneveld’s Abzolut label. With more tracks signed and due for release soon on Subplot Records & Inspirado.